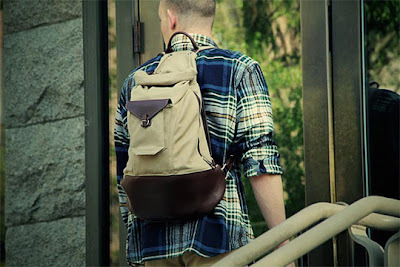 Boston’s George Guest is ready to properly enter the accessories market with their collection of bags and accessories. After three years of research and development, designers, George Keeler and Alexander Schultz, are ready to showcase their goods. We start with their canvas Hillside backpack with leather treatments throughout. It is made from thick 18oz duck canvas and features a roll/store top opening. The shape of the bag is unique. Shaped like a pear, it opens up for more storage towards the bottom.